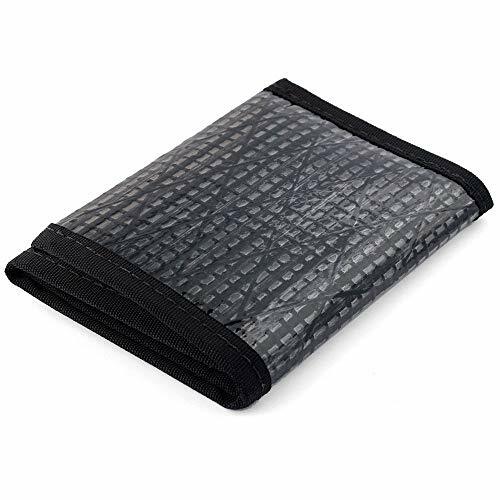 Store and protect your money and other valuables in style with this versatile Flowfold Sailcloth Slim Trifold Wallet. Constructed from reclaimed carbon fiber racing sailcloth, this wallet is "stronger than steel" and will stand the test of time. Its sleek and slender design allows you to carry it seamlessly in your front or back pocket. Designed by surfers and perfect for a day at the beach, this wallet includes black trim, 3 credit card slots, 2 hidden utility pockets, and 1 currency pocket to store your cash. Made in the USA on the coast of Maine. Measures 4.5" x 3.25" x 0.5" (when closed).